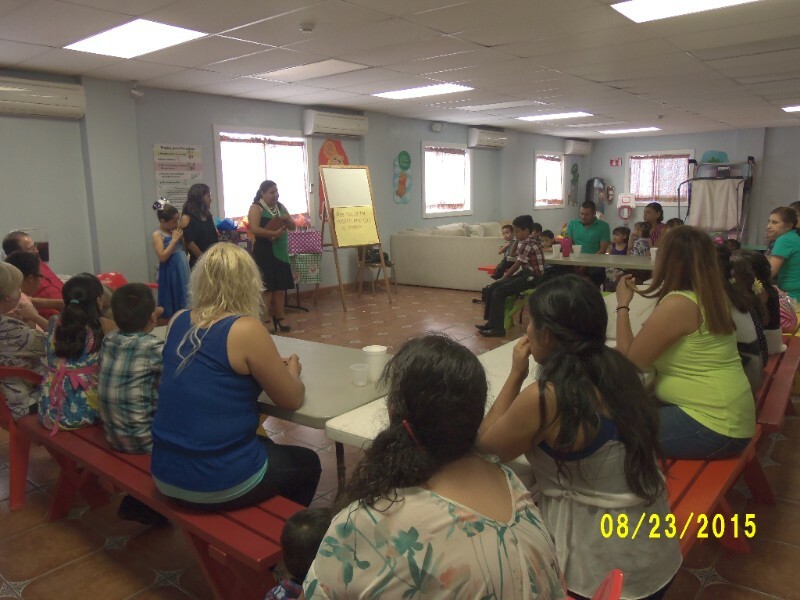 Sonshine Hacienda was in a flurry of activity the first week in July as we prepared for two important graduations. Our Kindergarten graduates were Alvaro Jr. (son of our administrators Alvaro and Diana), Anita (Granddaughter of Nanny, Imelda) and Lupita. The Kinder graduations are always so special. The children dance, sing, and are so cute. The Primary graduation ceremony (grades 1- 6) was also very impressive. The boys looked so handsome wearing all white with a light aqua cummerbund & bow tie. The girls were in all white with corsages the same color of aqua blue. Our two graduates were Rene and Mari Teri. I have to confess that I shed tears when I saw these two marching into the ceremony, but not for the reasons you might think. Rene suffers from something similar to Asperger Syndrome. He is on medication and it is a day-to-day struggle for Rene to handle the stress of school. So to me, it is a miracle that he is graduating, and moving on to Secundaria (like Junior High). As for Mari Teri, about one week prior to graduating, her father was given custody of her, and she is now living with her father. She now knows Christ and knows that she can call us at anytime. We are so proud of all of our graduates! 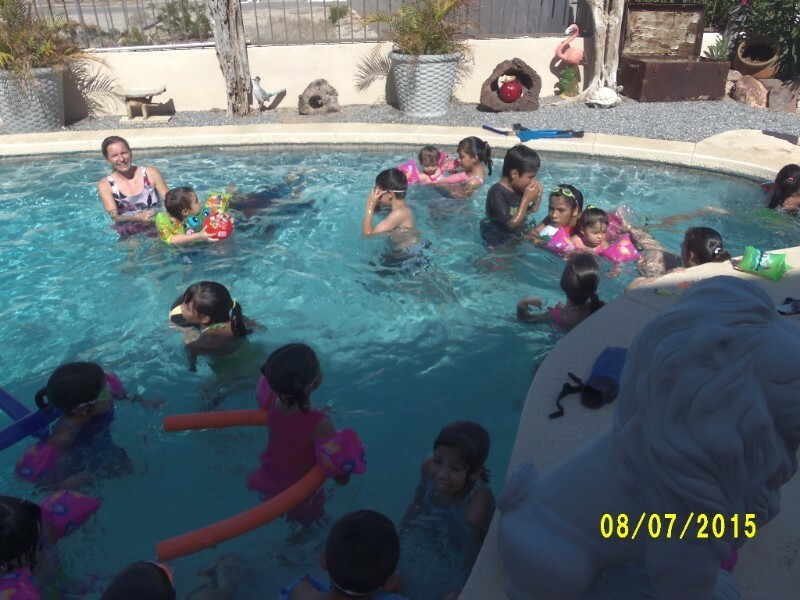 As in years past, Sonshine Hacienda allowed the kids to help select how we are going to celebrate our Graduations and Anniversary date (May 3 annually). Well… the kids are rather predictable. They voted to have a swim party with a BBQ and cake to follow. It worked perfectly for everyone because our neighbor invited the whole bunch of us to come to her pool, spend the afternoon and she even hosted the dinner….really great hot dogs, salad, chips, and yummy cupcakes. The kids loved the pool, and so did I. It was soooo VERY hot! WE HAD ONLY ONE RULE: If you were an adult and were going into the pool…you had to take a baby in with you. THANK YOU MARY LOU, JIM & REBECCA!! ++Thanks to the Lord for Joaquin’s recovery from his illness last month. He had a seizure and was hospitalized for a few days. ++Gary & Karen were blessed to have their granddaughter, Jasmine Lewis, for almost a month in August. She helped at Sonshine. Pray for God's guidance for her life. ++We praise the Lord for the generosity of the Rocklin Rotary Club in giving laptop computers to Sonshine for the kids. ++Thanks to the volunteers that built a Computer Lab for the kids. ++Thank you for all your prayers for Gary during his surgery in August. All went well. ++Diana & Alvaro were on vacation for a week. Karen & Gary filled in and they survived! A goal this summer was to prepare for the coming academic school year. Our kids are behind where they should be scholastically. We reached out to teachers, musicians, and psychologists to teach. The response was good. One example was Lucy Olalde from Rialto, CA, who came to Sonshine and spent two weeks teaching the kids English as a second language. Lucy trained members of our staff to teach the children once she left. The children smiled as they left class and tried out their new words on the English speaking staff. All summer the children studied Math, Spanish, English, and Geometry. This helps the children catch up to where they should be scholastically. On August 23rd, Profesora Norma pulled up in a big truck loaded with pans full of Tamales, beans, salad and a huge cake for the kids. Cars began to arrive. Profesora Norma and her Mexican friends entered the gates with their arms full of gift bags and boxes…all beautifully decorated. 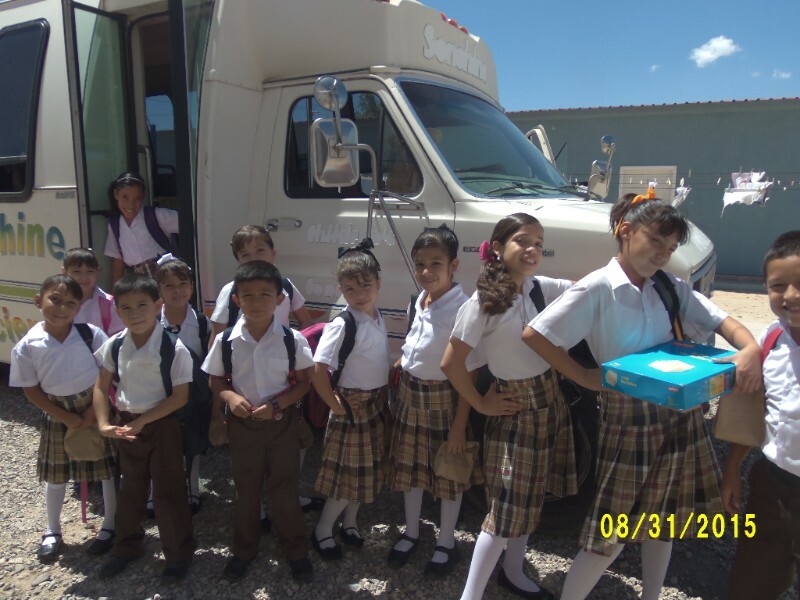 This was the day that Profesora Norma and her team of supporters of Sonshine children were coming to present to their designated children their needed items for their school uniforms. The children thanked each person with a mighty hug and a kiss. They also sat with their “Padrinos” during dinner. A padrino is like a God Parent. Thanks to many of you, our readers and supporters, who designated money toward school uniforms. That was used to sew the skirts for our girls.